Reports are surfacing that R&B diva Vesta Williams was found dead in her Hollywood hotel. Vesta was 53 years old and currently no cause of death is being reported. If you are an eighties baby like myself then you know that Vesta's 'Congratulations' was one of the biggest heartbreak songs in the eighties. I'm really saddened by her death and mostly because she never fully received the recognition I think she deserved. She was an unbelievable talent and now she's gone. Rest in Peace songbird. (Praise Cleveland) Vesta Williams (born 1958, Coshocton, Ohio) is an American R&B singer. She is sometimes credited by her full name and sometimes simply as Vesta. She is known for her full four-octave voice range. The daughter of a disc jockey, Williams began performing at an early age as a stand up comic and singer in high school. Her family moved from Ohio to Los Angeles in the 1960s. Williams and her sisters once appeared on the television show Jack and Jill as The Williams Sisters. She returned to Ohio in 1977 and sang in her cousin’s band in Dayton, but soon went back to Los Angeles to launch a solo career. Former Fifth Dimension member Ron Townsend put Williams in his band Wild Honey. She eventually became a highly sought after studio singer with stints with Chaka Khan, Gladys Knight and Stephanie Mills. Williams sang on the original version of Joe Sample’s “The Survivor”, and met producer David Crawford while working with his group Klique. She scored her first record deal in 1986 with A&M records which released her first self entitled album Vesta. The album featured her first Top 10 R&B hit “Once Bitten, Twice Shy”. 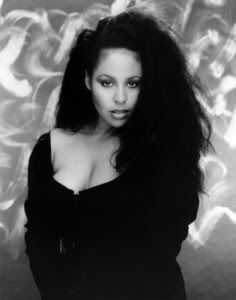 Her 1988 album, Vesta 4U, produced the quiet storm singles “Congratulations” and “Sweet Sweet Love”. The up-tempo dance track “4 U” also hit the R&B Top 10. In 1991, Williams released the album Special and the title track as a single. Both became her biggest charters. Her next album, Everything-N-More, was not as successful and she soon left A&M. She continued to be a popular session singer, landing regular spots on albums by such artists as Phil Perry, Howard Hewett and George Duke. In 2007 she released an album of R&B classics on the Shanachie label titled Distant Lover. Produced by Chris “Big Dog” Davis, it features songs originally recorded by Bill Withers, Stevie Wonder, Smokey Robinson, Marvin Gaye, Sade and Deniece Williams. Please get Vesta's year of birth right! This is quite shocking news. She could sho nuff sang.